Voice of America – A senior Russian defense official said Moscow will no longer sell any weapons to Syria until the situation there calms down, as a Syrian activist group said the death toll from the Syrian conflict has surpassed 17000. Vyacheslav Dzirkaln, the deputy chief of the Russian military and technical cooperation agency, said Monday that Russia will not sign any more arms deals, deliver any more weapons or ship any spare parts for weapons delivered earlier. The United States and other world leaders have pushed Russia to stop helping Damascus crackdown on the opposition there. In Moscow, President Vladimir Putin said the Syrian government and the opposition groups should be forced to enter negotiations. “I am convinced that we must do everything possible to force the conflicting sides to find a peaceful political solution to all the disputed issues,” Putin told a group of Russian and foreign diplomats in televised remarks. His comments came hours after his foreign minister, Sergei Lavrov, met with a senior Syrian opposition leader, Michel Kilo, in Moscow. Russia’s announcement that it will no longer send weapons to Syria comes as the head of the Syrian Observatory for Human Rights says more than 17,000 people have died in the Syrian conflict since it began in March of last year. Rami Abdelrahman said Monday that 31 died across Syria, including 11 Syrian army troops and 20 civilians and rebels. He said there was heavy fighting and army shelling in the provinces of Homs, Idlib, Daraa and Deir Ezzor, and near Damascus. “There is fighting everyday. It doesn’t ever stop,” Abdelrahman said. As regular readers of this new page are aware, I have been warning since last year that Russia and China do not need Syria as much as Syria needs them. Russia is attempting to have a diplomatic role here and its latest statements increase its credibility among many (this does not mean that Russia will not resume arms’ sales to Syria, only that its announcement is consistent with what Russia perceives is in its own current best interest). Although Russia’s Putin wants to teach the West several lessons, as does China, the reality is that Russia and China will back away from Syria and Iran if they feel it is in their best interest. The Bible shows that Syria’s capital city Damascus (Isaiah 7:8) will be destroyed (Isaiah 17:1). Whether this will happen because of internal civil war or an attack involving Israel remains to be seen–it is not likely to directly involve Russia. Syria’s Assad remains a close ally to Iran and Iran keeps taking steps that may provoke a regional (with Israel) or larger war (the USA itself could sustain damage). But whether it is involved in a war involving Israel or not, eventually, Damascus has to be destroyed, and probably relatively soon. What may happen is a regional war, that somewhat gets out of control and may involve Syria (Syria could also change because of its own internal war) and others (including many based in Lebanon) beyond Iran and Israel, is something I have warned could happen for some time now and really could be a factor that ultimately leads to the fulfillment of Daniel 9:27. Russia: Its Origins and Prophesied Future Russia in prophecy. Where do the Russians come from? What about those in the Ukraine? What is prophesied for Russia and its allies? What will they do to the Europeans that supported the Beast in the end? This entry was posted on Monday, July 9th, 2012 at 11:45 am	and is filed under Prophecy. 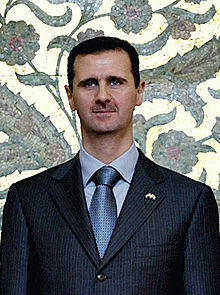 Hezbollah: Assad claims Russian missiles have arrived; SNC: No peace talks for now.